This Arts and Crafts masterpiece, designed by Charles and Henry Greene, was built in 1908 for John and Mary Gamble as a summer home. It was designated as a National Historic Landmark in 1977 and is significant for its architecture. 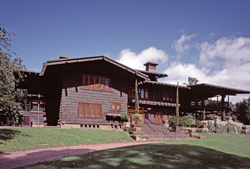 For more information, see Gamble House. The Old Sacramento Historic District was designated a National Historic Landmark in 1965. Pictured here are the Big Four building (individually listed as a National Historic Landmark in 1961) and the Nathaniel Dingley Steam Coffee and Spice Mill building, both of which are part of Old Sacramento State Historic Park. For more information, see Big Four Building.